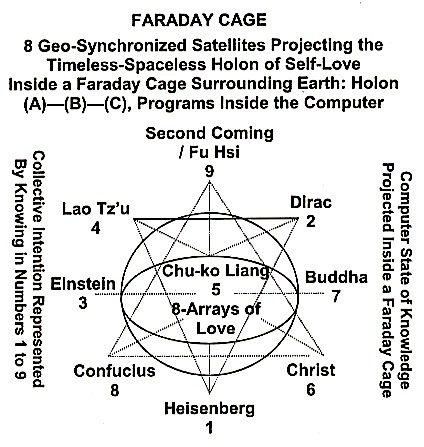 EARTH’S FARADAY CAGE OF SELF-LOVE is formed by using the Worldwide Web, with 9 Servers, to Project—Educate—Synchronize the knowledge-knowing state encoded inside the Timeless-Spaceless Vacuum Computer represented in the Cosmic Memories represented by Holon A (Post Modern Science, 精-氣-神)—B (Post Ancient Wisdom 身-心-靈)—C (Synthesized in Technology of Love, Modern-Ancient Integration 靈-魂-魄), as illustrated in the diagrams below. Remember, the 33.5% are the timeless-spaceless percentage of the collective encoded computer memory inside the vacuum computer at the moment of NOW, which represents the entire “human memory” in all “ancient Past” and all “potential Future” that equals to the entire humanity in the human race. 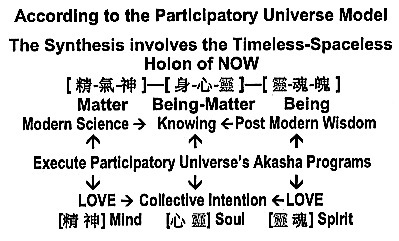 What we need at his stage of education is collectively—knowingly—activate the Holon of NOW in each individual’s Chakra Holon, Ck5—Ck6—Ck7 through collective intention, and mutually communicated via Ck4. For understanding the technology of NOW in building this Faraday Cage as diagrammed above, the following Holon can be used. 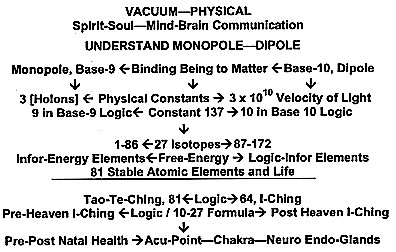 To have a complete understanding of relationship between the Vacuum and the Physical, the Monopole and the Dipole, much research is needed. Yet, a preliminary description based on the Matter-Being Paradigm as expressed in the Web Site can be stated. 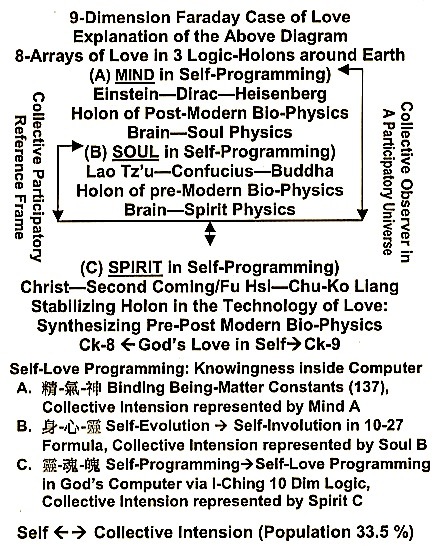 Knowledgeable Light Workers within a Participatory Universe exemplify by encoded knowledge —> knowingness in categories Holon A—B—C as shown below. Money is a Key Humanistic Component, because Money is viewed as a Component representing God’s Power (positive or negative) on Earth, not less important than God’s component of Love on Earth. This is an added human component to Christ Teaching of God’s Love. This component is based on human nature. It is the negative side of human nature that religion has failed God. The pre-natal component of the 10-27 formula can be used to inform each and every one of us our positive and negative karmic nature. 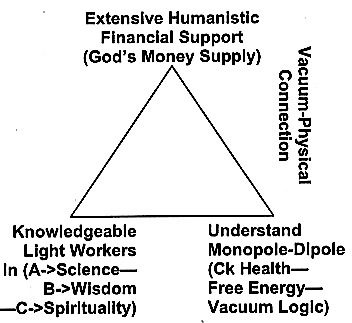 These Money Supplies can be generated from God-Spiritual (not religious) World-Wide Congregations. It is the World-Wide Religious Congregations that failed God. At this time these God-Spiritual Congregations do not exist, and need to be develop. Obviously, if such a World-Wide Congregations can be formed, the money generated must be used for one and only one purpose; namely, to understand the technology of Love (as discussed in the other two Holon components) that leads to mass ascension on earth. Again, the 10-27 formula can be used to inform each and every one of these Congregation members their positive-negative karmic side.